Adding A Plot Twist To Your Story? Foreshadow it! As I (very cleverly) hinted in my previous article, foreshadowing is something which every writer should do if they want to include a plot twist in their story. If you are not sure what foreshadowing is, then it basically means hinting at things which will happen in the future. In other words, if you’re going to add a plot twist to your story, then you need to leave a few subtle clues about it before it happens. Otherwise, it isn’t a plot twist – it’s a rather cheap and melodramatic “Tomato Surprise” which can leave your readers feeling more than a bit cheated. The reason why foreshadowing is so important is because all stories consist of a logical progression of events. If you look it up in a dictionary, this is probably what you will find under “story”. As such, throwing something completely unexpected and illogical at your readers will probably confuse them and break the suspension of disbelief which is essential for most stories. Foreshadowing your plot twists avoids this by giving your readers enough subliminal hints that your plot twist could at least possibly be a logical and believable part of the story. The real trick is to make sure that you foreshadow your plot twist in a way that means that most of your readers won’t guess it before it happens but, when they re-read your story, they will suddenly notice all of the little clues which hinted at the plot twist later in your story. This is, of course, a way of giving your story “added value” to readers who are re-reading it too. I’d give you a list of examples of stories with very well-written plot twists, but this would inevitably involve ruining the surprise. But, if you want an old and well-known example, then read Ambrose Bierce’s excellent short story “An Occurrence At Owl Creek Bridge“. One plot twist you must never use without a lot of foreshadowing is the classic “it was all a dream” plot twist. This is an old plot twist and, more likely than not, your readers will still feel cheated unless it is done in a new and innovative way and there is a ton of very clever foreshadowing. Ok, how do I do this “foreshadowing” thing? What you need to do to foreshadow a plot twist is obviously different for every story and every plot twist, but here are some of the more well-known ways of foreshadowing plot twists. Be aware that because they’re so well-known, your readers may be more likely to spot them, so if you can think of a more inventive foreshadowing technique- then use it! – Double meanings: You have to be careful with this one, since it can reveal your plot twist if it’s done badly, but if you include a few lines of dialogue which have double meanings (one referring to the plot twist and one referring to another subject) then this can be a good way of foreshadowing a plot twist. However, it has been done quite often, so readers might be more aware of it than they might have been a few decades ago. One cheesy example of this could be if you are writing a horror story where the plot twist is that the man who your protagonist is dating is actually a vampire (and not one of the harmless, sparkly types of vampire either). 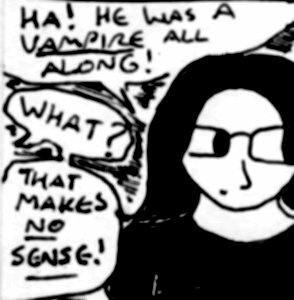 Then you could add a few lines of dialogue earlier in the story where the vampire says things like “yes, I go out drinking every night” and “I’m not really much of a morning person” etc… These both refer to the fact that he’s a vampire, but they also have perfectly innocent explanations too. – Mystery: If there is something slightly mysterious about a character or something subtly strange about the setting of your story, then this can be a good way of hinting that there could be something else going on without actually giving your readers any explicit clues. One well-known example of this in sci-fi fiction is the flawed utopia. Everything in a city/planet/spaceship looks perfect – but very slightly too perfect. Of course, it isn’t long before the main characters learn that there is something far more sinister going on behind the scenes. – Misdirection: This is where you distract the reader with something else whilst you hint at your plot twist. This technique works best in comics, films etc.. but it can also work well in prose fiction if it is done carefully (eg: burying a subtle clue about a plot twist in a conversation about something far more interesting). Another clever, but more difficult, technique involving misdirection is to add a few “red herrings” (note: this link contains spoilers to ‘The Da Vinci Code’) to your story which lead your reader to expect a plot twist which is very different to what the actual plot twist is (although this must be done in a way that the “clues” could reasonably be applied to either plot twist). -Hiding it in plain sight: This can be truly spectacular when it’s done well. Basically, you don’t hide the clue itself but you don’t tell your readers that it’s a clue. This one is kind of similar to the previous point on this list, but it has to be handled slightly differently. Just remember to either have a character talk about or see something related to the plot twist. Going back to my earlier example about the statue, you could have your protagonist talk to someone else who briefly mentions myths about statues. Or your protagonist briefly read the title of an old book which mentions living statues whilst he or she is looking through a pile of other old books [this is also a good example of misdirection too]. Of course, if the clues are subtle enough, then when the statue suddenly comes to life and starts attacking everyone near the end of the story – then your readers will be shocked, but they won’t feel cheated. This entry was posted in Writing and tagged creativity, Foreshadowing, how to, Plot twist, writing. backdrop to a landscape teaming with natural wonders. You may also hike to the Quill to explore the volcano. Perhaps, it is the light, tropical breezes that gently soothe the soul.